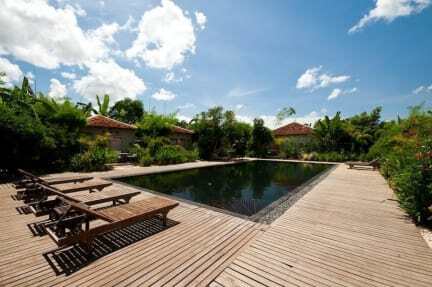 Phka Villa Battambang is an oasis of calm and peaceful retreat, located in center of town and far away from the busy city streets. The hotel is one of the finest in battambang and offers a beautiful black tiled pool and a restaurant serving Khmer and Western dishes. 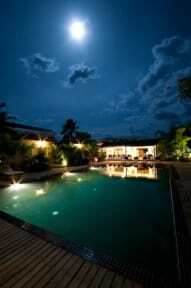 Phka Villa offers a total of 10 bungalows features traditional bungalows, set amidst picturesque surroundings. The guestrooms feature traditional khmer taste offering a pure thrill of local lifestyle. All the guestrooms are spacious and equipped with decent modern facilities including air-conditioning, ceiling fan, private veranda, sun terrace, hot and cold water, in room safe, DVD player, Mini Bar Stock, Hair dryer, electric kettle, bathrobe, attached bathroom and a bonus flower for a unique experience with warmth of traditional hospitality.